In Mahayana and Vajrayana Buddhist thought, a bodhisattva (Chinese: 菩薩; pinyin: púsà; Japanese pronunciation: bosatsu; Korean pronunciation: bosal) is a being who is dedicated to achieving complete Buddhahood. That is their reason for "being" or raison d'être. Conventionally, the term is applied to beings with a high degree of enlightenment. Bodhisattva literally means a "bodhi (enlightenment) being" in Sanskrit. Mahayana practitioners have historically lived in many other countries that are now predominantly Hindu, Muslim or Theravada Buddhist; remnants of reverence for bodhisattvas has continued in some of these regions. The following is a partial list of bodhisattvas primarily respected in Indian, Tibetan Buddhism and East Asian Buddhism. Chinese: 虛空藏; pinyin: Xūkōngzàng; Japanese pronunciation: Kokūzō; Korean: 허공장, Tibetan: ནམ་མཁའི་སྙིང་པོ།, THL: Namkha'i Nyingpo ) is a bodhisattva who is associated with the great element (mahābhūta) of space (ākāśa). The bodhisattva of compassion, the listener of the world's cries who uses skillful means to come to their aid; the most universally acknowledged bodhisattva in Mahayana Buddhism and appears unofficially in Theravada Buddhism in Cambodia under the name Lokeśvara. This bodhisattva gradually became identified predominantly as female in East Asian Buddhism and its name may originally have been Avalokitāśvara. (Chinese: 地藏; pinyin: Dìzáng; Japanese pronunciation: Jizō; Korean: 지장; Vietnamese: Địa Tạng, Tibetan: ས་ཡི་སྙིང་པོ, THL: Sayi Nyingpo ). Kṣitigarbha is a bodhisattva primarily revered in East Asian Buddhism and usually depicted as a Buddhist monk. His name may be translated as "Earth Treasury", "Earth Store", "Earth Matrix", or "Earth Womb". Kṣitigarbha is known for his vow to take responsibility for the instruction of all beings in the six worlds between the death of Gautama Buddha and the rise of Maitreya, as well as his vow not to achieve Buddhahood until all hells are emptied. He is therefore often regarded as the bodhisattva of hell-beings, as well as the guardian of children and patron deity of deceased children and aborted fetuses in Japanese culture. Mahāsthāmaprāpta (Korean: Daeseji) is a mahāsattva representing the power of wisdom, often depicted in a trinity with Amitābha and Avalokiteśvara, especially in Pure Land Buddhism. His name literally means "arrival of the great strength". In some Buddhist texts such as the Amitabha Sutra and the Lotus Sutra, he is referred to as Ajita. Chinese: 彌勒; pinyin: Mílè; Japanese pronunciation: Miroku; Korean: 미륵; Vietnamese: Di-lặc, Tibetan: བྱམས་པ་, THL: Jampa ). According to both Mahayana and Theravada Buddhism, Maitreya is regarded as the future buddha. Buddhist tradition, Maitreya is a bodhisattva who will appear on Earth in the future, achieve complete enlightenment, and teach the pure dharma. According to scriptures, Maitreya will be a successor to the present Buddha, Gautama Buddha. The prophecy of the arrival of Maitreya refers to a time in the future when the dharma will have been forgotten by most on the terrestrial world. This prophecy is found in the canonical literature of all major schools of Buddhism. Maitreya has also been adopted for his millenarian role by many non-Buddhist religions in the past such as the White Lotus as well as by modern new religious movements such as Yiguandao. Mañjuśrī is a bodhisattva associated with prajñā (transcendent wisdom) in Mahayana Buddhism. In Tibetan Buddhism, he is also a yidam. His name means "Gentle Glory". Mañjuśrī is also known by the fuller Sanskrit name of Mañjuśrīkumārabhūta, literally "Mañjuśrī, Still a Youth" or, less literally, "Prince Mañjuśrī". The Niō (仁王) are two wrath-filled and muscular guardians of the Buddha standing today at the entrance of many Buddhist temples in East Asian Buddhism in the form of frightening wrestler-like statues. They are dharmapala manifestations of the bodhisattva Vajrapāṇi. According to Japanese tradition, they travelled with Gautama Buddha to protect him and there are references to this in the Pāli Canon as well as the Ambaṭṭha Sutta. Within the generally pacifist tradition of Buddhism, stories of dharmapalas justified the use of physical force to protect cherished values and beliefs against evil. The Niō are also seen as a manifestation of Mahasthamaprapta in Pure Land Buddhism and as Vajrasattva in Tibetan Buddhism. Padmasambhāva "Lotus-Born", also known as Guru Rinpoche, is a literary character of terma, an emanation of Amitābha that is said to appear to tertöns in visionary encounters and a focus of Tibetan Buddhist practice, particularly in the Nyingma school. Samantabhadra Universal Worthy is associated with practice and meditation. Together with the Buddha and Mañjuśrī, he forms the Shakyamuni trinity in Buddhism. He is the patron of the Lotus Sutra and, according to the Avatamsaka Sutra, made the ten great vows which are the basis of a bodhisattva. In China, Samantabhadra is associated with action, whereas Mañjuśrī is associated with prajñā. In Japan, Samantabharda is often venerated by the Tendai and in Shingon Buddhism, and as the protector of the Lotus Sutra by Nichiren Buddhism. In the Nyingma school of Tibetan Buddhism, Samantabhadra is also the name of the Adi-Buddha - in indivisible Yab-Yum union with his consort, Samantabhadrī. Only revered in Chinese Buddhism and Taoism, Sangharama refer to a group of devas who guard viharas and the faith, but the title is usually referring to the legendary Chinese military general Guan Yu, who became a dharmapala through becoming a Buddhist and making vows. Sitātapatrā "the White Parasol" is a protector against supernatural danger. She is venerated in both Mahayana and Vajrayana traditions. She is also known as Uṣṇīṣa Sitatapatra. Sitātapatrā is a powerful independent deity as she was emanated by Gautama Buddha from his uṣṇīṣa. Whoever practices her mantra will be reborn in Amitābha's pure land as well as gaining protection against supernatural danger and black magic. Chinese: 韋馱; pinyin: Wéituó; Japanese pronunciation: Idaten; Korean: 위타천; Vietnamese: Vi Đà, Tibetan: གདོང་དྲུག་, THL: Dongdruk , Mongolian: Арван Хоёр Нууд) Skanda is regarded as a devoted guardian of viharas and the Buddhist teachings. He is the leader of the twenty-four celestial guardian deities mentioned in the Golden Light Sutra. In Chinese temples, Skanda faces the statue of the Buddha in the main shrine. In others, he is on the far right of the main shrine, whereas on the left is his counterpart, Sangharama, personified as the historical general Guan Yu. In Chinese sutras, his image is found at the end of the sutra, a reminder of his vow to protect and preserve the teachings. (Ch: 日光, Riguang, Kr. Il Guang, Jp: Nikkō) One of two attendants of Bhaisajyaguru. (Ch. 度母, Du Mu) Female bodhisattva, or set of bodhisattvas, in Tibetan Buddhism. She represents the virtues of success in work and achievements. 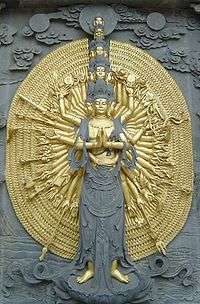 Also a manifestation of Avalokiteśvara. Vajrapāṇi (Sanskrit, "Vajra in [his] hand") is one of the earliest-appearing bodhisattvas in Mahayana Buddhism. He is the protector and guide of Gautama Buddha and rose to symbolize the Buddha's power. Vajrapani is extensively represented in Buddhist iconography as one of the three protective deities surrounding the Buddha. Each of them symbolizes one of the Buddha's virtues: Mañjuśrī manifests all the Buddhas' wisdom, Avalokiteśvara manifests all the Buddhas' compassion and Vajrapāṇi manifests all the Buddhas' power as well as the power of all five tathāgatas. Vajrapāṇi is one of the earliest dharmapalas and the only Buddhist deity to be mentioned in the Pāli Canon as well as be worshiped in the Shaolin Monastery, in Tibetan Buddhism and in Pure Land Buddhism, where he is known as Mahasthamaprapta and forms a triad with Amitābha and Avalokiteśvara. Manifestations of Vajrapāṇi can also be found in many Buddhist temples in Japan as dharma protectors called the Niō or "Two Kings". Vajrapani is also associated with Acala, who is venerated as Fudo-Myō in Japan, where he is serenaded as the holder of the vajra. Vasudhārā whose name means "stream of gems" in Sanskrit, is the bodhisattva of wealth, prosperity, and abundance. She is popular in many Buddhist countries and is a subject in Buddhist legends and art. Originally an Indian bodhisattva, her popularity has spread to Theravadin countries. Her popularity, however, peaks in Nepal, where she has a strong following among the Buddhist Newars of the Kathmandu Valley and is thus a central figure in Newar Buddhism. She is named Shiskar Apa in Lahul and Spiti. ↑ Horner (1975), The minor anthologies of the Pali canon, p. 97. Regarding Metteyya, Bv XXVII, 19: "I [Gautama Buddha] at the present time am the Self-Awakened One, and there will be Metteyya...."
↑ Buddha Dharma Education Association (2014). "Suttanta Pitaka: Khuddaka Nikāya: 14.Buddhavamsa-History of the Buddhas". Guide to Tipiṭaka. Tullera, NSW, Australia: Buddha Dharma Education Association. Retrieved 2014-12-21. ↑ Lopez Jr., Donald S. (2001). The Story of Buddhism: A Concise Guide to its History and Teachings. New York, USA: HarperSanFrancisco. ISBN 0-06-069976-0 (cloth) P.260. ↑ Schaik, Sam van. Tibet: A History. Yale University Press 2011, page 34-5, 96-8. ↑ "The gods of northern Buddhism". Wisdom Library.